The blade deeply recurved, with three narrow fullers along the spine, the entire surface inlaid in elaborate running vine motifs in gold. The bronze hilt with elongated triangular ears, embellished with wolves hunting amongst vegetation and a large baldheaded, mustachioed male figure with arms upraised. Mid-19th century. The earliest Armenian historian, Moses of Khoren (c. 410-490 c.e.?) records in his History of Armenia, an ancient Armenian god known as Kund (or Bald) Aramazd who presided over Navasand, the Armenian New Year. Armenian Yataghan sword – mid 19th c.
Armenian Yataghan sword hilt – mid 19th c.
Armenian Yataghan sword hilt, mid 19th c.
Kinda reminds of the Hittite swords illustrated on the walls of Hattusa. Hittite were one of the oldest Indo-European speaking people, inhabiting the Armenian highlands. 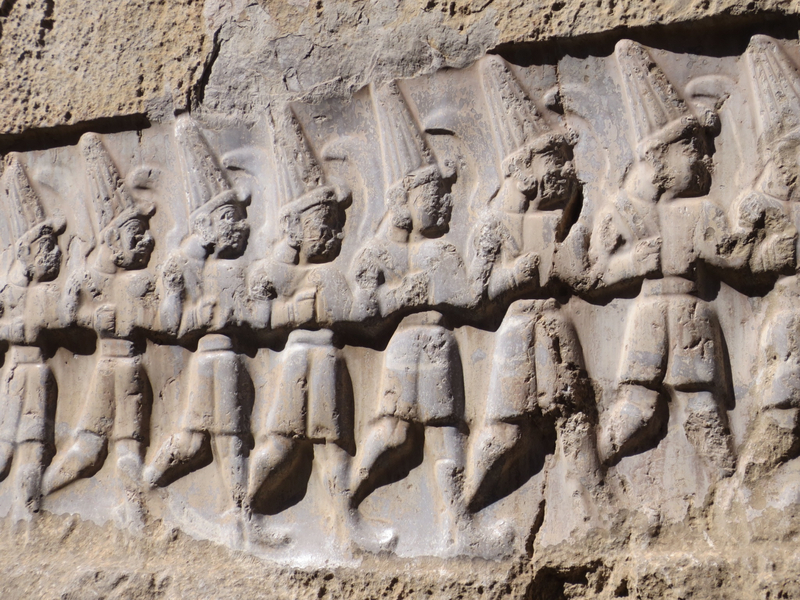 Wall carvings of warriors of Hatusa.